Saturday, my wife, Carlyn, and I volunteered at Marra Farm as part of Bowdoin College’s Common Good Day, where we’re alumni. We spent 3 hours weeding the raspberry patch and have the scratches to show for it. Carlyn picked up a nice wasp sting as well. There was a beautiful paper wasp nest attached to some of the raspberry canes that we noticed after she was stung. 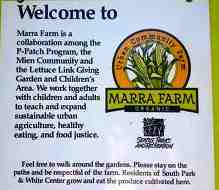 Marra Farm is in the South Park neighborhood of Seattle and is part of Seattle Parks. It was a woking farm (owned by the Marra family) from the 1880’s until the 1970’s, when the city purchased it. It’s over 4 acres and is worked by several different groups: a neighborhood P-Patch, a Mien community garden, a children’s garden utilized by Concord Elementary School, and an acre of garden tended by Lettuce Link volunteers that provides food for local food banks. T he garden coordinator, Sue, said that 22,000 pounds of food was grown on that acre of land last year, all by volunteers like us.